Word processor with a simple interface. Is there a better alternative to MOAppsTexts? 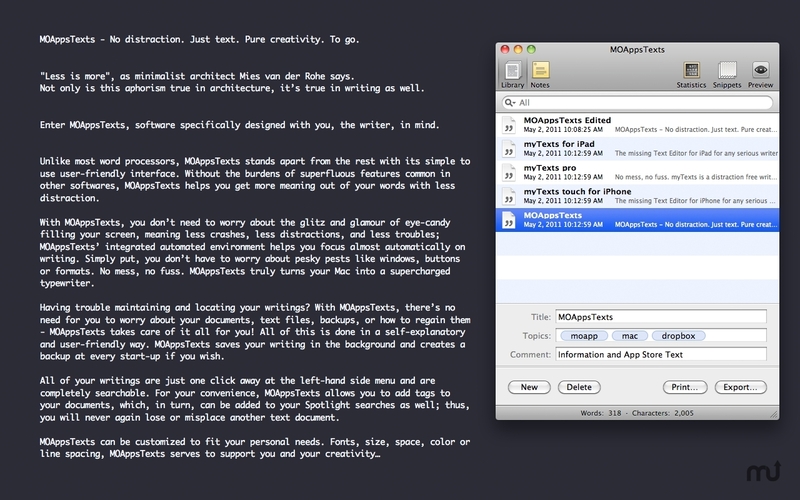 Is MOAppsTexts really the best app in Word Processing category? Will MOAppsTexts work good on macOS 10.13.4? MOAppsTexts... Unlike most word processors, Texts stands apart from the rest with its simple to use user-friendly interface. Without the burdens of superfluous features common in other softwares, Texts helps you get more meaning out of your words with less distraction. MOAppsTexts needs a rating. Be the first to rate this app and get the discussion started! With Texts, you don't need to worry about the glitz and glamour of eye-candy filling your screen, meaning less crashes, less distractions, and less troubles; Texts' integrated automated environment helps you focus almost automatically on writing. Simply put, you don't have to worry about pesky pests like windows, buttons or formats. No mess, no fuss. Texts truly turns your Mac into a supercharged typewriter. Having trouble maintaining and locating your writings? With Texts, there's no need for you to worry about your documents, text files, backups, or how to regain them - Texts takes care of it all for you! All of this is done in a self-explanatory and user-friendly way. Texts saves your writing in the background. All of your writings are just one click away at the left-hand side menu and are completely searchable. No man is an island - not even the best poet. Since we write to be widely read and understood, Texts multi-format file support makes it easy to exchange files with the outside world. Texts inherently has read/write support to common and prevalent file formats like txt, rft, doc.